The OMEGA™ CS8DPt is a 1/8 DIN size digital controller featuring the big CNPt Series colour-changing display. 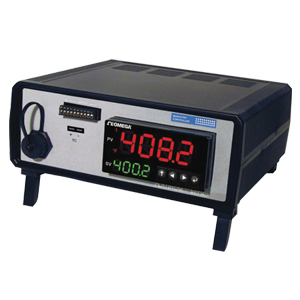 This bench controller features the LED displays that can be programmed to change colour between Green, Amber, and Red at any set-point or alarm point. Other options include, serial communications, Modbus®, and Ethernet. This universal temperature and process instrument handles 10 common types of thermocouples, multiple RTDs, thermistors and several process (DC) voltage & current ranges, and strain type of inputs. Display: 4-digit dual or 6-digit single, 9-segment LED; Red, Green, and Amber programmable colours. Note: Power cables with plugs suitable for use in most countries are available to order separately. The OMEGA™ Cs8DPt controllers can serve Web pages over an Ethernet LAN or even over the Internet, making it possible to monitor and control a process through a Web browser (such as Microsoft Internet Explorer®) from anywhere in the facility or anywhere in the world. For example, using an CS8DPt Series temperature controller to control a heater, an engineer can monitor the temperature, change set-points or alarm points, turn the heater on and off, or make other modifications from anywhere on the local network or anywhere on the Internet. The Web pages are easily customized, and secure, password protected access to the devices is easily controlled. And it requires absolutely no special software on the engineer’s computer to view the data and “supervise” the controller— nothing other than a Web browser. In fact, the Cs8DPt controller can even send an e-mail to the engineer (or anyone he or she chooses) about an alarm condition or to update the status. Using the power of the Internet, the engineer could receive a message from the controller on an Internet-enabled pager or mobile phone. Most remarkable is that all this can be accomplished without a computer. The OMEGA™ CS8DPt controller connects directly to the Ethernet network—not to the serial port of a computer functioning as a “server” and “master” to “slave” instruments connected through serial communications. The devices are also available with RS232 and RS485, and MODBUS serial communications (specify the C24 option). IEC Power cable with stripped ends 250 Vac max. Nota: Comes complete with 2 output power cables and quick start manual. Full user manual available for free download.